Four Seasons at Upper Freehold is located in western Monmouth County, New Jersey. This gated 55+ community is comprised of 387 single-family homes which blend in beautifully with the surrounding rural landscape. Ponds, fountains, and open space create a relaxing atmosphere in Four Seasons at Upper Freehold. The area is dotted with rolling hills and lovely country roads, yet offers convenient access to major shopping and enjoyable dining facilities. Each of the homes in this upscale adult community are energy efficient and meet the New Jersey Energy-Star standards. Between the clubhouse amenities, social interest groups, scheduled activities, and surrounding golf courses, residents will never run out of things to do. This age-restricted community requires at least one occupant be 55 or better and no one under the age of 19 may permanently reside in the community. The clubhouse welcomes residents with a cozy fireplace lounge and the ambiance continues to the library and billiards area. It also features a high tech state-of-the-art fitness center where residents can work out in style by themselves or by participating in group exercises such as yoga and Pilates. Part of the exercise facilities is an indoor pool with retractable roof. The clubhouse also has computer access, a card room for joining a game with friends, and an arts and crafts studio for your latest project. Residents can get together for social events in the ballroom complete with dance floor. Outdoors, residents can take a refreshing dip in the outdoor pool. For outdoor activities, there are tennis courts, bocce ball courts, a golf putting green, and horseshoe courts. There is also a picnic area for gatherings. Scenic ponds dot the landscape, while a series of walking and biking trails are perfect for early morning jogs. Homebuyers can select from nine different models. While the last home was completed in 2004 by K. Hovnanian, there are a variety of homes available on a resale basis. Houses have two or three bedrooms and two or three-and-a-half bathrooms. Sizes range from 1,480 to 3,430 square feet. All homes have two-car garages and some have lofts, basements, or sunrooms. Patios, thermal windows, storm doors, and security systems are additional features that are available. The median lot size is one fifth of an acre. Four Seasons at Upper Freehold offers an upscale country club lifestyle with easy access to daily conveniences. In addition, golf courses and wineries in the area provide plenty of opportunities for recreational off-site activities. Residents can take advantage of the large variety of amenities offered at the clubhouse and attend many social events throughout the year. A full-time activities director is on hand to keep the activity calendar full and organized. Some popular activities and clubs include ballroom dancing, planned trips, book club, billiards, yoga and much more. Residents are also active in a variety of existing special interest groups and are encouraged to start new ones. This age-restricted community is located close to the New Jersey Turnpike, highways I-195, I-295, and Route 130. Residents can walk to the historic area of Allentown which is full of quaint shops and unique dining establishments. Upper Freehold is home to major shopping centers and freeways. For additional shopping excursions, Quaker Bridge and Freehold Mall are only a 20 minute drive away. The Cream Ridge Winery is a popular destination that holds festivals and wine tasting events. When grandchildren come to visit, they are sure to enjoy Six Flags Adventure Amusement Park and Safari. For golf enthusiasts, there are plenty of courses to choose from in the area including Gamblers Ridge, Cream Ridge, Charleston Springs, Hanover, Mercer Oaks, and Cranbury. For those who want big city shopping and entertainment, it is only 40 miles to Philadelphia and 60 miles to New York City. 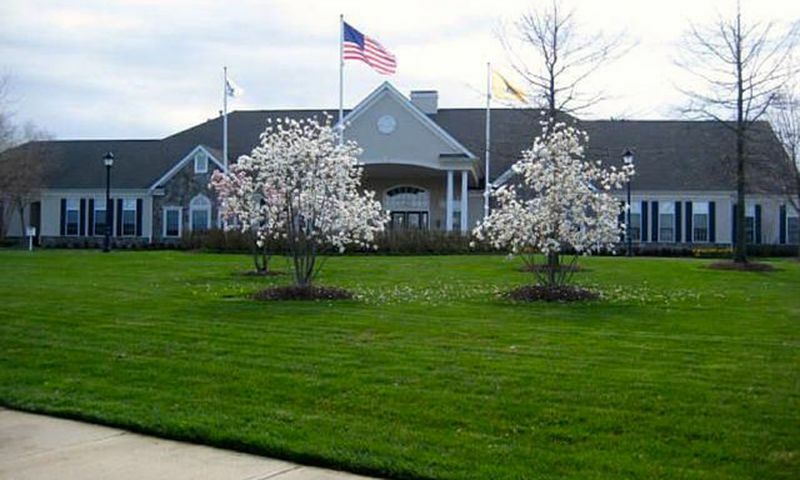 Four Seasons at Upper Freehold is an ideal active adult community in Central New Jersey. Clubhouse - 17,500 Sq. Ft. There are plenty of activities available in Four Seasons at Upper Freehold. Here is a sample of some of the clubs, activities and classes offered here. There are a wide variety of single-family homes available on a resale basis. Homes typically have two to three bedrooms, two to three-and-a-half bathrooms and a two-car garage. We enjoy living here and ended up buying our place after an exhausting search. We liked the area, it's gated and the price was right. The clubhouse is fantastic, my wife especially raves about the decorating over there. We both use the pool a lot in the summer and the gym once it starts getting cold. Otherwise we like to walk outside or play tennis. There are lots of different events happening all the time so there is always something to do. If you are bored it is your own fault. My wife makes sure our social calendar is always full! 55places.com is not affiliated with the developer(s) or homeowners association of Four Seasons at Upper Freehold. The information you submit is distributed to a 55places.com Partner Agent, who is a licensed real estate agent. The information regarding Four Seasons at Upper Freehold has not been verified or approved by the developer or homeowners association. Please verify all information prior to purchasing. 55places.com is not responsible for any errors regarding the information displayed on this website.